The green fluorescent Ca2+ sensor, G-GECO, increases in fluorescence intensity in response to increases in intracellular calcium. G-GECO was developed in Robert Cambell’s lab at the University of Alberta . Changes in fluorescence in living cells can be detected with epifluorescence microscopy or on automated fluorescence plate readers. #U0600G G-GECO increases in fluorescence when Ca2+ levels increase in the cell. It is bright, robust and easily detectable on a fluorescence plate reader. No need to fix or lyse your cells. The following protocol is optimized for measuring Ca2+ responses in rapidly dividing, immortalized cell lines on a 96-well plate, and has been validated in live CHO, NIH 3T3, and HEK 293 cells [Graham FL, 1977]. This assay is very robust and can be used for live-cell imaging or for screening on automated fluorescence plate readers. For use in iPSC-derived or adherent cells, see Suggestions for Assays in Adherent Cells section. G-GECO Ca2+ sensor BacMam in ESF 921 Insect Culture Medium (Expression Systems, product # 96-001-01). Green fluorescent sensor that changes in fluorescence intensity in response to increases in cAMP. VG/mL is the number of viral genes per milliliter, as distinct from plaque forming units (PFU), that for baculovirus, would be measured in insect cells. For each transduction reaction (i.e. one well in a 96-well plate), prepare the transduction solution by mixing 20 μL of the Sensor BacMam stock with 0.6 μL of the 500 mM stock solution of sodium butyrate*, 5 μL of the Receptor control, and 24.4 μL of the complete culture media for your cells, for a total volume of 50 μL. Mix gently. Incubate ≈ 20-24 hrs under normal cell growth conditions, protected from light. 50 μL of the cell resuspension will be required for a single well in a 384-well plate. A plating density of 12,500 cells per well is a good starting point, so prepare the cell suspension at 250,000 cells/mL. Depending on the cell type and plate type, 10,000-15,000 cells per well may be optimal. For each transduction reaction (i.e. one well in a 384-well plate), prepare the transduction solution by mixing 5 μL of the Sensor BacMam stock with 0.3 μL of the 500 mM stock solution of sodium butyrate, 1 μL of the Receptor control, and 18.7 μL of the complete culture media for your cells, for a total volume of 25 μL. Mix gently. Step 3) Mix Cells and Transduction Mix from above. Mix Tube A and Tube B (50 μL tube A + 25 μL tube B). Mix gently and seed 75 μL of the mix per well on the 384-well plate. * In step 1, the volume of the cell suspension per well can be reduced from 50uL to 25 uL if desired, for a final plating volume of 50uL per well after the completion of step 3. Make sure that the well is still receiving 12,500 cells. For each transduction reaction (i.e. one well in a 96-well plate), prepare the transduction solution by mixing *4 μL of the Purified Sensor BacMam stock with 2.5 μL of the 300 mM stock solution of Valproic Acid, 1 μL of the Receptor control, and 42.5 μL of the complete culture media for your cells, for a total volume of 50 μL. Mix gently. *4μL of Purified Sensor BacMam stock is a good starting point, but a range of 2-8 μL may need to be tested if 4μL is suboptimal. Please note: When testing the positive controls 24 hrs after transduction, add Isoproterenol or Forskolin to 10μM or 50μM, respectively. If the Receptor control wasn’t included, test with Forskolin only. Prior to measuring fluorescence, replace culture media with DPBS (containing calcium and magnesium). Wash gently so as not to dislodge cells. 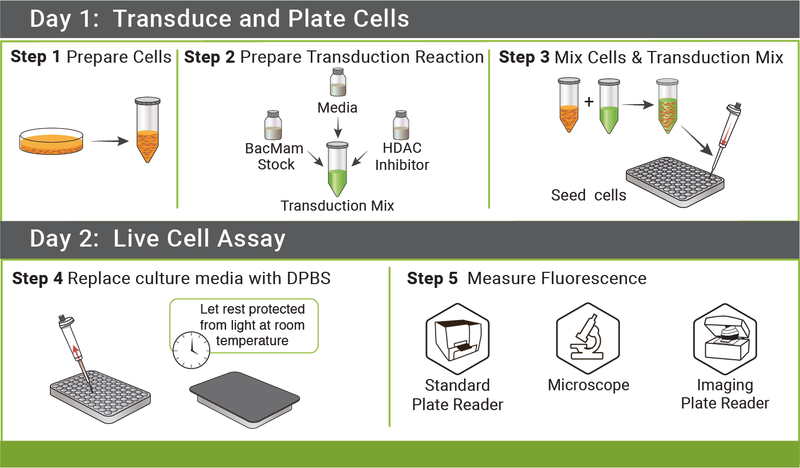 Cover the cells and allow them to rest at room temperature in DPBS for 25-40 minutes before measuring fluorescence so they can adjust to their new environment. Experiments are performed at 25°C using standard GFP excitation and emission wavelengths. When monitoring the green fluorescence emitted by the sensor, a change in fluorescence intensity will be observed after addition of compounds that increase levels of Ca2+in the cell. This sensor is constructed with a green fluorescent protein. The optimal excitation wavelength for the green fluorescent G-GECO sensor is 480 nm, but the absorption band of this protein is quite broad, so broad bandpass filters that pass 450 to 480 nm light can be used effectively. On the emission side, the green light spans 510 to 550 nm, so broad band pass emission filters can also collect much of the emission. These filter properties are similar to many of the FITC filter sets commonly available on most microscopes and plate readers. Preferred excitation and emission wavelengths are 488/525. Figure 1. Absorption and emission properties of the a typical green fluorescent protein plotted as a function of wavelength. Unlike many assays that measure accumulation of Ca2+ in cell lysates, the R-GECO assay measures Ca2+ in living cells, in real time. Changes in Ca2+ can occur quite rapidly, so the application of drug and resulting changes should be captured as quickly as possible. The best possible experimental setup involves capturing the fluorescence from a well of cells first, before the addition of any compound, and then again a second or two after the compound addition. The maximal response is reached ~ 3 seconds after the addition of the agonist and in HEK293 cells, returns to baseline after 10-12 seconds. Figure 2. HEK 293 cells transduced with the R-GECO biosensor, activated with carbachol. The graph shows the expected timing and duration of Calcium when using the positive controls provided in your kit. Twenty four hours after transduction, you should see bright green fluorescent cells in a typical epifluorescence microscope, or the transduced wells in a 96 well plate should be significantly more fluorescent than untransduced cells in wells on the same plate. HDAC inhibitors may be important to maintain expression of the sensors.While BacMam transduction alone will result in sensor expression, sodium butyrate or another HDAC inhibitor, such as valproic acid (VPA) or trichostatin A (TSA), will generate higher levels of expression and will maintain this level of expression [Kost, T. et. al. 2007]. If cells look unhealthy, use lower concentrations or no HDAC inhibitor. If the cells are expressing the sensor, and fluorescence is detectable on your instrument, then check the sensor using the positive control included in this kit. Adding 5 μL of the M1 muscarinic receptor virus to a set of control wells will ensure that a Gq-coupled receptor is present in your cells. You can double check to make sure the receptor is expressed by examining the cells in a fluorescent microscope with filters for green fluorescence. You should see the green sensor fluorescence throughout the cell, and red nuclear fluorescence that marks the cells that also express the M1 muscarinic receptor. Addition of isoproterenol will cause a change in fluorescence, as shown in Figure 2. If it does not, then it is important to use this positive control to optimize three aspects of your assay. First, a serial dilution series of the sensor with a constant amount of receptor virus can be used to find the optimal sensor expression for your instrument and cell line. Second, it is important that you find the amount of virus sufficient to transduce all of the cells in the well. Third, it is important to determine what the kinetics of the response is and whether your instrument can measure in the appropriate time frame. 2. Boyce, FM; Bucher, NL (1996). “Baculovirus-mediated gene transfer into mammalian cells”. Proceedings of the National Academy of Sciences of the United States of America 93 (6): 2348–52. doi:10.1073/pnas.93.6.2348. PMC 39799. PMID 8637876. 3. Graham FL, Smiley J, Russell WC, Nairn R: Characteristics of a human cell line transformed by DNA from human adenovirus type 5. J Gen Virol 1977, 36(1):59-74. 4. Dulbecco R and Vogt M: Plaque formation and isolation of pure lines with poliomyelitis viruses. The Journal of experimental medicine 1954. 5. Tewson, Paul et al. “Simultaneous Detection of Ca2+ and Diacylglycerol Signaling in Living Cells.” PLoS ONE 7.8 (2012): e42791. 6. Kost T, Condreay J, Ames R, Rees S, Romanos M: Implementation of BacMam virus gene delivery technology in a drug discovery setting. Drug Discovery Today 2007, 12(9-10):396-403.